Rabbits are often purchased as pets, especially around the spring holidays. They look so cute and cuddly, but potential caretakers rarely know how to care for the specific needs of their new companions. As a result, many rabbits are relegated to outdoor cages, turned loose in the wild, or given to animal shelters. Most pet stores obtain bunnies who are about 4 weeks old because they look cute and require little space. However, these very young rabbits are not ready to be weaned from their parents. Bunnies are social creatures with individual personalities, just like a cat or a dog. They require attention, specific foods, stimulating environments, and veterinarians who know how to treat them. 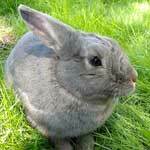 Rabbits can live up to 8 years, but can become withdrawn if not given plenty of love and affection. They cannot tolerate extreme temperatures and prefer to live indoors during cold weather. Domestic rabbits cannot survive in the wild. They don’t know how to forage and don’t have a family group to rely on like wild rabbits do. They don’t know where to find water or what foods are safe to eat. A single rabbit cannot build a shelter; a burrow takes several rabbits to complete. Moreover, domestic or house rabbits will usually stay near where they have been abandoned and so are easy prey for cats, dogs, raccoons and other predators. A house rabbit can live 8 or more years in a protected home environment while the average wild bunny lives only 6 months to a year. If you would like to help support one of our precious farm animals or give a unique gift to the animal lover in your life, consider Sponsorship! You can make a difference! It’s easy! Just click one of the options below and know that you are truly changing lives. You will receive a certificate that includes a photo of your sponsored animal and their inspiring story! The certificate is customizable for gift giving purposes! Sponsorship certificates show your respect and compassion for farmed animals everywhere. 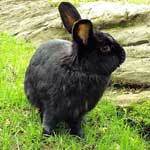 Al is a handsome black rabbit who was abandoned, possibly with Barney, in a park on the Queens-Long Island border. Since house rabbits cannot live in the wild, he was quite lucky to have been rescued and he now lives at Safe Haven where he gets lots of petting, brushing, toys and treats. He shares a room with his friend Barney. 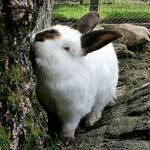 Barney is a sweet white house rabbit who was abandoned in a park on the Queens-Long Island border. He was found along with a beautiful black bunny friend named Al. They were very fortunate to be rescued by a veterinary technician who was walking in the park. Barney and his friend Al now share a room at Safe Haven where they have plenty of toys and treats to enjoy during the winter. In the warm months, they have fun in their own outdoor play area. Keme was rescued by two compassionate people who saw him huddled near the curb on a busy street in Queens. He was most likely a house rabbit who was abandoned outdoors. He surely would have been killed by predators or a moving vehicle if he had not been rescued. We welcomed Keme to our farm family and he made himself right at home. He has a room to play and stay safe during the winter months. In the warm months, he enjoys his own outdoor play area.